Contamination forms on a clean multi-layer surface (top) when EUV photons react (middle) with gases, resulting in carbonaceous deposits (bottom). Sometime soon, microchip fabricators will take the next major step in the relentless reduction of feature size, from the current minimum of 22 nm down to 10 nm and perhaps even smaller. Getting there, however, will entail much more than incremental progress. It will require adopting entirely new technology and surmounting a formidable roster of technological problems. One of most daunting of those – identifying and characterizing the factors that cause contamination of key lithographic components – has begun to yield to investigators in PML's Sensor Science Division, who have made some surprising and counterintuitive discoveries of use to industry. In general, feature size is proportional to the wavelength of the light aimed at masks and photoresists in the lithography process. Today's super-small features are typically made with "deep" ultraviolet light at 193 nm. "But now we're trying to make a dramatic shift by dropping more than an order of magnitude, down to extreme ultraviolet (EUV) at 13.5 nm," says physicist Shannon Hill of the Ultraviolet Radiation Group. "That's going to be a big change." In fact, it complicates nearly every aspect of lithography. It will necessitate new kinds of plasmas to generate around 100 watts of EUV photons. It demands a high-quality vacuum for the entire photon pathway because EUV light is absorbed by air. And of course it requires the elimination of chemical contaminants on the Bragg-reflector focusing mirrors and elsewhere in the system – contaminants that result from outgassing of materials in the vacuum chamber. As a rule, the focusing mirrors are expected to last five years and decrease in reflectivity no more than 1 percent in that period. Innovative in-situ cleaning techniques have made that longevity possible for the present deep UV environments. But the EUV regime raises new questions. "How can we gauge how long they're going to last or how often they will have to be cleaned?" says Ultraviolet Group leader Thomas Lucatorto. "Cleaning is done at the expense of productivity, so the industry needs some kind of accelerated testing." Unfortunately, Hill adds, "You can't even test one of these mirrors until you know how everything outgasses. Ambient hydrocarbon molecules outgassing from all the components will adsorb on the mirror's surface, and then one of these high-energy photons comes along and, through various reactions, the hydrogen goes away and you're left with this amorphous, baked-on carbonaceous deposit." But what, exactly, is its composition? How long does it take to form, and what conditions make it form faster or slower? To answer those questions, the researchers have been using 13.5 nm photons from the NIST synchrotron in a beam about 1 mm in diameter to irradiate a 12-by-18 mm target in multiple places. "We built a chamber where we can take a sample, admit one of these contaminant gases at some controlled partial pressure, and then expose it to EUV and see how much carbon is deposited," Hill says. The chamber is kept at 10-10 torr before admission of contaminant gases, and the inside surface plated in gold. "Gold is very inert," Hill explains, "and we want to be able to pump the gases out of the chamber with no traces remaining." In the course of building the chamber, "we learned some solid chemistry that was unfortunate," Lucatorto recalls. "These things are typically sealed with copper gaskets. Our stainless steel chamber was coated with gold, and we used copper gaskets. Well, it turns out that gold loves copper. It naturally forms a gold-copper alloy just by being in contact. So we could not take the flange off!" This chamber and attached apparatus (see diagram, bottom) are used to introduce various gases to test contamination build-up on multi-layer surfaces. "We made it even worse," Hill adds, "because we baked these chambers – heated them up to clean them off. So it was effectively welded. We had to get a crowbar and a hammer to get the edges apart. After that, we had our gaskets covered with silver." 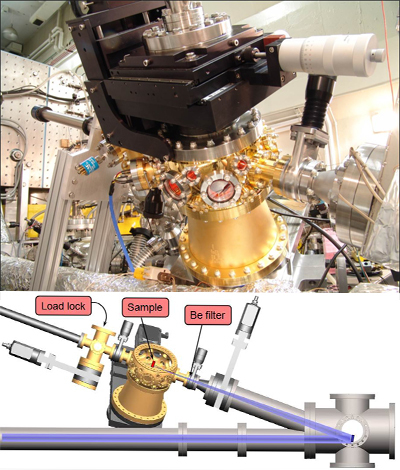 The PML team uses two techniques to analyze the EUV-induced contamination – x-ray photoelectron spectroscopy (XPS), which reveals the atomic composition and some information on chemical state, and spectroscopic ellipsometry, which is very sensitive to variations in optical properties – integrated with data from surface scientists at Rutgers University. "The great thing about spectroscopic ellipsometry," Hill says, "is that it can be done in air and it can map all the spots on the sample in 8 or 9 hours. But being NIST, we're concerned with measuring things accurately. And we've determined if you want to determine how much carbon is present, ellipsometry alone may not be the right way to go – it can give you some misleading answers. XPS is much slower. It takes around 4 hours just to do one spot. But the two techniques give complementary information, so we use both. "There are several things we wanted to investigate, and one was the pressure scaling of the contamination rate – nanometers of carbon per unit time. Each spot was made in a very controlled way, at a known pressure and EUV dose. The key thing we started finding is that the rate does not scale linearly with pressure. It scales logarithmically. That's not at all what you'd expect. It's counterintuitive, and it has really important implications for the industry. You could spend millions of dollars designing a system in which you were able to lower the background partial pressure by, say, two orders of magnitude. You would think that you'd done a lot. But in fact, you would have only decreased your contamination rate by a factor of two – maybe." In addition, PML collaborated with the research group at Rutgers that was headed by NIST alumnus Theodore Madey until his death in 2008. "They have a world-class surface-science lab that studies the fundamental physics of adsorption," Hill says. The Rutgers investigators found, contrary to simple models in which all the adsorption sites have the same binding energy, that in fact the measured adsorption energy changes with coverage. "That is," Hill explains, "as you put more and more molecules on, they are more and more weakly bound. That can qualitatively explain the logarithmic relation we found." 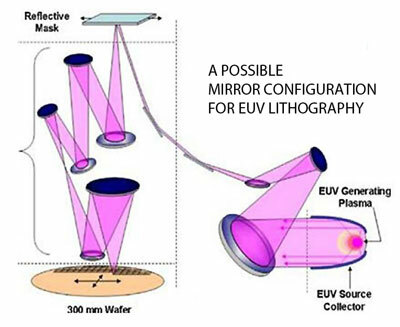 EUV lithography requires multiple mirrors (multi-layer Bragg reflectors) to position and focus the EUV beam. "Shannon and Ted [Madey] were the first to fully explain this and present it to the surface-science community," Lucatorto says. Industry benefits because the work clearly shows manufacturers that they cannot evaluate a product's contamination potential by taking measurements at a single pressure or intensity. In a parallel line of research, Hill, Lucatorto and the other members of the Ultraviolet Radiation Group – which includes Nadir Faradzhev, Charles Tarrio, and Steve Grantham – along with collaborator Lee Richter of the Surface and Interface Group, are studying the outgassing of different photoresists that may be used in EUV lithography. The outgas characteristics have to be known in rigorous detail before a wafer and resist can be placed in an enormously expensive lithography apparatus. Using another station on the NIST synchrotron's Beam Line 1, they are exposing the photoresists to 13.5 nm light and measuring the outgassed substances both in the gas phase and as they are "baked" by EUV photons on a witness plate. "There are commercially available ways to test resists using electrons as proxies for EUV light, under the assumption that the effects are relatively similar and scale in comparable ways," Hill says. "But right now, NIST is the only place available to any company to test these things using photons." So far, the throughput is around two a week. "We'll get faster," Lucatorto says. "Companies would like us to do 10 or more a week. By comparison, for deep UV lithography – when contamination from outgassing was not as great a concern – resist manufacturers would test thousands of resists each month to refine lithographic quality."